This bold, vibrant reproduced painting of an Evening Grosbeak is by Chicago bird artist Walter A. Weber. This detail featuring the colorful finch is part More... of a larger work which also includes a Northern Cardinal and a Dark-eyed Junco. 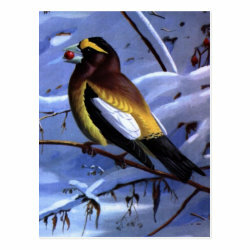 This illustrated painting of an Evening Grosbeak is perfect for anyone that loves these gorgeous winter finches.